Show-biz polymaths, Seth Rogen (PeekYou profile here) and James Franco (PeekYou profile here), have already lampooned the pop-cultural juggernaut known as “Kim and Kanye” (or, if you prefer, the widely-employed portmanteau, Kimye), with their shot-for-shot remake of Kanye’s somewhat racy, and Kimye-centric, “Bound” video. That video went hugely viral this past fall, and can be found below. 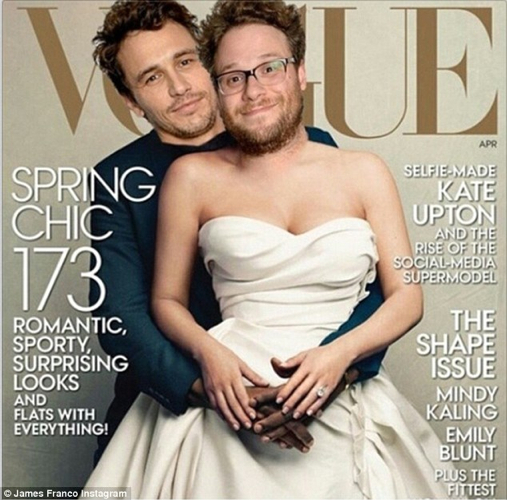 With Kimye’s Q Scores spiking of late, due to their appearing on the cover of the latest issue of Vogue — which apparently is something a lot of people really care about — Seth and James have decided to pay the couple tribute once more; this time with a crude Photoshop job, tweeted out by Rogen. The Internet was, as the Internet will be, amused. 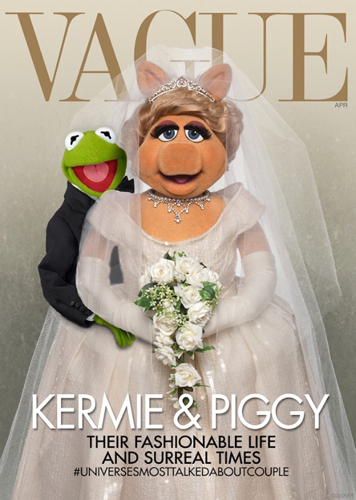 Among the many others getting in on the act — and yes, there is an act to get in on, as again we mention that for some reason, some people really care about this — The Muppets. You can read about what Sarah Michelle Gellar had to say about this bafflingly controversial cover here, and visiting Seth’s and James’ PeekYou profiles will provide you with links related to their countless endeavors and works, both Kimye-related and beyond (and to their credits, it’s mostly beyond).